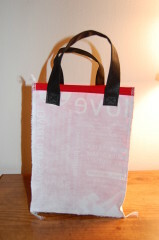 The two reusable tote bags I started out with were a funky Lulu Lemon bag that had some sort of slick coating on it, and the other was a promotional item from a conference I attended recently which had uncoated, soft sides. The fronts and backs of the bags I used are shown below (the bag on the left is the Lulu Lemon shopping bag). The first thing I did was rip those puppies apart down the sides, since I only needed the fronts and backs to make my bag. Next, you want to finish the top edges of the bag. You could just fold it over and straight stitch it, but I had some red bias tape handy and went with that. I just sewed a strip of bias tape along the top of each of the bag side pieces. I didn’t bother to trim the edges or even back-stitch at either end, since it was just going to be sewn into the side seams anyhow. After you’ve finished the top edges, you want to put the handles on. I made my handle strips 12″ long each and just placed them where I thought looked good and sewed them on with what I am going to call an x-box. I have no idea if there is a real name for this reinforcing sewing technique, but 30 seconds on Google couldn’t tell me, so “x-box” it is. Basically, it’s when you sew a square shape with an X in the middle to reinforce something like a strap. Because the bag sides are all the same width, it doesn’t really matter which two sides you put the handles on. In the case of my bag, however, the front and back are different patterns, so I put one handle on each of the red sides, so that they would become the front and back of the bag. Once you have the handles on, you can sew it all together. I cut out two pieces for the base because I wanted to make it a little stronger, but you could do just one piece. If you are doing two pieces for the base, you want to first put the two bottom pieces wrong sides together (if you are using the same kind of bags I did and they are solid color, there really isn’t a “wrong” side) before proceeding. 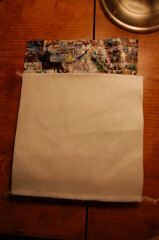 Once you’ve done that, the piece you want to show on the OUTSIDE of the bag will be considered the “right” side of the piece. Take any one of your side pieces and lay it wrong side down, on top of the right side of the base piece, matching the bottom edge of the side piece with a bottom edge of the base piece. Sew along the matched edges. Repeat this for the opposite side piece. The picture below shows how it should look once you’ve place the side and base together and sewn along the edge. A few notes about this photo: I took this photo after I had sewn two sides on, so you may notice stitching along the top of the bag base as well, but don’t let it confuse you. Also, I was not thinking clearly and actually did my bias tape and handles AFTER I sewed all of the sides to the base, which is why you don’t see them in these photos. You’ll be smart and do it in the order I’ve written the instructions, which will be much easier on you. I chose to serge my edges, but this fabric doesn’t seem to unravel, so a straight stitch should work just fine. The dimensions I gave are just what I used, and the bag was intended to hold patterns, so if that’s what you’re looking for, it will do the job nicely! 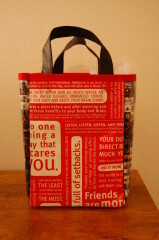 It would also make a great lunch bag or anything else you could think to use it for. This is the first project tutorial I’ve ever written, so forgive me if it’s hard to follow or my pictures are not clear examples of what I was doing. If you have any questions, let me know and I will do my best to help you! Anyway, great bag! I love the colors/patterns :) It would be cool to repurpose pretty much any strong-ish piece of flexible material this way.